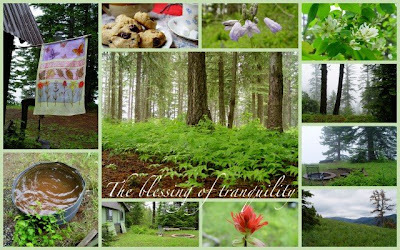 Thank you, Lord, for the blessing of tranquility; for quietness, gentle rain, wildflowers, and vast scenic views. For nature that provides serenity like that found nowhere else. Thank you for calmness and peace found in a walk in the woods, a hot cuppa tea, and a great book to read in a quiet corner. Gentle refreshment, a day to rest, and replenishment. Oh to join you there for a cup of tea and a discussion of that good book. It's so peaceful at your mountain retreat. Course I don't know that for certain, but it certainly looks peaceful. Sounds wonderful. I can feel myself relaxing just reading your post. And I'm not even really busy today.